Cloth diaper company teams up with Little House on the Prairie®. 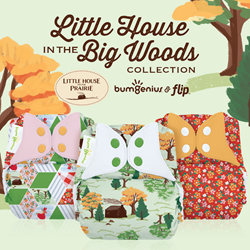 Cotton Babies, Inc., maker of the best-selling bumGenius® cloth diaper line, has announced a licensing deal with Little House on the Prairie®. Available now, the Little House in the Big Woods™ Collection is an exclusive set of 3 prints that capture the spirit of Laura Ingalls Wilder. The trio of prints are available in all bumGenius and Flip® styles and accessories. The prints in this series, named Prairie Flowers, Patchwork and the Big Woods, were inspired by elements of the first book in the series, Little House in the Big Woods. Each print features original artwork created by Cotton Babies. The Big Woods features the Ingalls family’s cabin surrounded by evergreen and maple trees in every direction. Patchwork is an 1870s era star quilt pattern that mimics the patchwork quilts that Laura made with her sister, Mary. Prairie Flowers includes pink and orange prairie flowers scattered across a red calico inspired by young Laura’s iconic dress and bonnet. Little House on the Prairie has much to celebrate in 2017 as the brand celebrates Laura Ingalls Wilder’s 150th birthday. To learn more about cloth diapers and to get your own Little House on the Prairie diapers, visit cottonbabies.com. The Little House in the Big Woods collection will also be available at select independent retailers throughout the country. Calling Fenton, Missouri home, Cotton Babies is a privately held market leader in the juvenile product industry and a diverse retailer, offering cloth diapers and a wealth of other products designed to make parenting easy. Cotton Babies is a socially active organization supporting outreach and diaper grant programs for financially underprivileged families. CEO Jennifer Labit is a founding chair of the Real Diaper Industry Association. Cotton Babies products are sold on CottonBabies.com and through independent juvenile products stores and major retailers. Cotton Babies diaper brands include bumGenius™, Flip™, Econobum™, and Elemental Joy™. Find Cotton Babies on Facebook, Instagram, Pinterest, and the OEKO-TEX® Buying Guide. Little House on the Prairie remains popular in syndicated reruns and has been on the air in the U.S. continuously since its original run. In addition to airing on local stations, it is currently broadcast in the U.S. on INSP (The Inspiration Network) and Cozi TV. Little House on the Prairie can also be seen in more than twenty-five other countries worldwide. The official Little House on the Prairie website was launched in March 2015 and serves as a home for fans of the classic books, television series, and the beautiful culture that has developed around them. Website visitors to littlehouseontheprairie.com can celebrate their pioneering spirit by engaging with fun lifestyle content related to cooking, crafting, gardening and family activities. Fans can also learn about the rich history of Laura Ingalls Wilder and find inspirational quotes and interviews. Friendly Family Productions (FFP) is a Los Angeles-based entertainment company which owns film, television, merchandising, theme park and other rights in and to the beloved Little House books by Laura Ingalls Wilder, as well as to the Little House on the Prairie® trademark. FFP launched the official Little House on the Prairie® website and has developed a highly engaged social media following. The company executive produced a documentary called “Little House on the Prairie: The Legacy of Laura Ingalls Wilder”, which was a #1 bestseller on Amazon. The Company is managed by Trip Friendly.